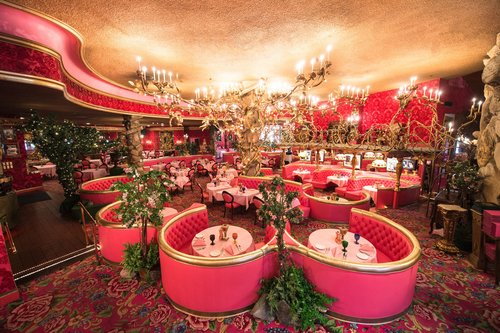 Also, almost every room at Madonna Inn has a different theme. The place has got some funky vibes, and for our Parents Weekend, we rented out one of their many ballrooms to host a dinner and silent auction. The auction was a wonderful time. Ate some salad and pasta with the Mama and Papa, shared some stories, and watched my parents spend 120 dollars on Dom Pérignon champagne and dark chocolate. But this post isn’t about Parents Weekend (although it almost was), it is about a weird little moment I stumbled upon when I excused myself to go to the bathroom. After drinking a couple glasses of water at dinner, I naturally had to take a trip to the bathroom. As I was bouncing along to the Men’s room, I noticed the unmistakable electric hum and energetic rhythm of live music resonating from across the hall. Curious, I peeped around the corner, and there in front of me was a wide hardwood dance floor, a live band of 4 dudes all over the age of 60, and a bunch of equally old people dancing the night away. I found a table in the corner of the room, pulled out a chair, and sat back to listen to the music and take in the scene. So, I’m sitting there in my dirty black vans, wrinkled white dress shirt, and stained sports jacket, watching this odd collection of elderly couples dancing when suddenly the band transitions into the infamous and ever relevant song “Sweet Caroline” by Neil Diamond. As if struck by a lightning bolt of youth, the dance floor of “elderly” people I’d been watching ballroom dance were swaying and dipping with the same vitality and coordination you’d see on ABC’s “Dancing with the Stars”. Amidst the elegant swirl of the dance floor, one couple struck me as especially impressive. They appeared to be in their early 80s, and despite the wrinkled skin and seemingly frail bones, they twirled and swung together as if they’d be doing it since their High School Prom. As Sweet Caroline built up to it’s signature sing along chorus, I couldn’t help but have my eyes glued to the fluid and effortless way in which these two geezers glided across the dance floor. The gentleman, in his crimson red tie, clear rimless glasses, and baggy dress pants twirled his lady, who was rocking a light rose dress and black beret, and as they slid past each other, I caught him send her one of the most suave and meaningful winks I’ve ever witnessed. 2.) There's no place I'd rather be. Switch back to me, still sitting there looking like a teenage schmuck, thinking I was just enjoying a couple songs before going back to dinner, when suddenly a mighty hammer of emotion smashed down from above and forced me to longingly admit: whatever that couple has, I want it. What I witnessed between that elderly couple, a connection so ingrained and natural it flowed like water down the side of a mountain, was something I think we can all agree is the essence of something we all want. It may not manifest in a relationship, but that feeling of flow and connection is one we’re all familiar with. When the perfect song comes on in the shower, and a swirling montage of the past, present, and future of your life launches you into a nostalgic hazy glow, that’s it. When playing music with people you’ve jammed with for years, and you can predict, just by looking at them, what chord they’re going to play next, that’s it. When you see one of your best friends, and instead of saying hi, you burst out into an understanding laughter that kind of just says “It’s great to see you”, that’s it. When you’re watching one of those difficult to define pinkish-orange-golden sunsets with your best friends, conversation ceases for a couple seconds, and you kind of just float as if swept up by Aladdin’s magic carpet, that’s it. I could go on and on, but I hope you get the point. It’s the moments where you’re in the moment. Those fractions of time where the puzzle pieces fit.